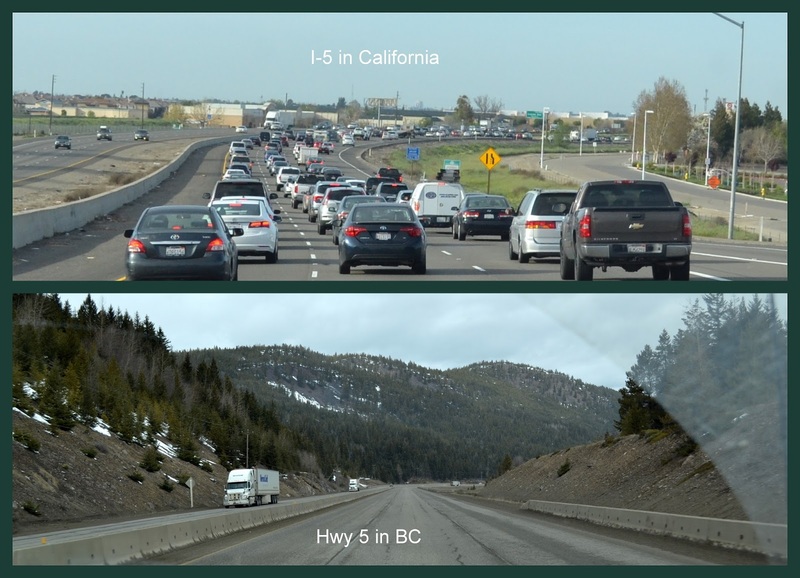 The long drive home after a winter visit in southern California offers a variety of highway choices for us to follow. Several things lead us to decide which one it will be, and with all the mountain passes between California and British Columbia, weather is a big factor. We have travelled most of them more than once but do not tire of the sights we will see. We’ve decided to head up through “the Grapevine” on Interstate 5. The Grapevine is best known for its bad winter road conditions that can close it down but it is seeing good weather and not going to be a problem for us on this trip. The Grapevine is only one part of the road ahead so we can also enjoy other sights on the drive. The 65 km (40 mi) journey passes over the Tehachapi Mountains from northern Los Angeles County to the San Joaquin Valley in Kern County with the highest point of this pass is 1275 metres (4183 ft). After reaching the summit we will pass the state historic monument of Fort Tejon, which was established in 1854 to protect the people of the San Joaquin Valley from the stock rustling that was a big problem at that time. Passing by with all the traffic does not allow for the best photo but this is Pyramid Lake, which was named after the pyramid shaped rock carved out by engineers building the Old Highway 99. This earth and rock dam is 123 m (386 ft.) tall and is part of the California Aqueduct, which is part of the California State Water Project. 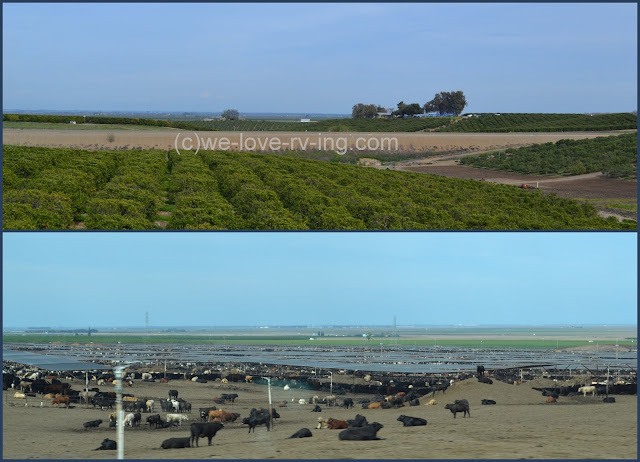 There is a stretch of I-5 south of Sacramento, California, which offers several different varieties of citrus fields, as shown here, as well as fields of cattle, many of which seem to be in these stock yards. You won’t miss the stock yards, you can smell them before you get there. Sorry to say the citrus don’t offer their fragrance for us to enjoy from our truck, though. 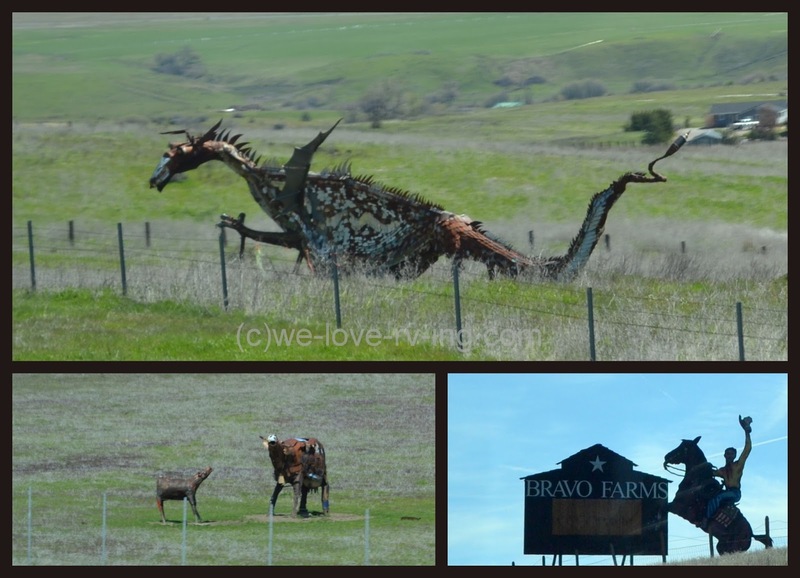 “Art is in the eye of the beholder” is an old expression and comes to mind when we pass these metal art sculptures of the dinosaur/dragon and the cow with calf near Yreka, Calif. They are not in the same field but although they have a similarity to one another, they may or may not be made by the same person. The ‘bravo farms’ is a wooden billboard farther south. Lake Shasta is one of the largest lakes in the western United States with a shoreline of 587 km (365 mi) when the lake is full. We have seen the lake at so many lower levels than this one shown, but not the lowest which was in 1977-’78 when the shoreline was only 199 km (124 mi). It was down 71 metres (234’) from the top level. There are several sights in this area we have yet to see, including the Shasta Caverns and the Shasta Dam. Also in the Shasta area is the Castle Crags State Park. This incredible rock formation is on the northwest edge of the park, giving it the name, and the park offers many amenities for fishing, camping and hiking. For those inclined, this sounds like an incredible place for the hiking enthusiasts with its miles of trails. The Pacific Crest Trail winds through the park on its path between Mexico and Canada. I have taken dozens of photos of this beautiful Mount Shasta as we have passed by, on this route as well as another route taken on travels heading south. It has been shrouded in winter clouds at times but most often Mt. Shasta is seen offering this pristine cover of snow with the prettiest blue sky as the backdrop! Traffic can be a problem due to such things as accidents because of the winter climates. Another one is passing through the big cites at rush hour, which, by the way, can last more than one hour! Considering all of this and choosing good travel times all comes into the planning of the trip. You do not want to end your day driving through a big city during rush hour after spending hours on the road. Great pics especially Mt Shasta! !